After months of writing, editing, copy-editing, reviews and production, I am pleased to announce the general availability of The Art of Community! The book is printed and on its way to bookstores – it may take a few days for it to hit your local bookstore or regional online store. This is a book that I have been working on since November, designed to provide a solid guide to building, energizing and enabling pro-active, productive and enjoyable communities. The book covers the major areas of community leadership, distilling a set of best practices and experiences, illustrated by countless stories, anecdotes and tales. While the book draws from my experience in Open Source and cites the experience of others in other communities, the book is not explicitly designed for technical communities and the content is applicable to any community of any size. This has been a deliberate decision: I am really keen that anyone from a knitting group to a neighbourhood watch group to a political activism group to a globally distributed Open Source project can get some real value from the book. Foreword by Leo Laporte – emmy award-winning broadcaster and founder of the TWiT Network provides a thoughtful foreword, complete with his expected wit and repartee. Chapter 1 – The Art of Community – We begin the book with a birdâ€™s-eye view of how communities function at a social science level. We cover the underlying nuts and bolts of how people form communities, what keeps them involved, and the basis and opportunities behind these interactions. Chapter 2 – Planning Your Community – Next we carve out and document a blueprint and strategy for your community and its future growth. Part of this strategy includes the target objectives and goals and how the community can be structured to achieve them. Chapter 3 – Communicating Clearly – At the heart of community is communication, and great communicators can have a tremendously positive impact. Here we lay down the communications backbone and the best practices associated with using it. Chapter 4 – Processes: Simple Is Sustainable – We then move on to focus on putting the facilities in place for your community to do great things. In this chapter we build simple, effective, and nonbureaucratic processes that enable your community to conduct tasks, work together, and share their successes. Chapter 5 – Supporting Workflow with Tools – We continue our discussion of community facilities to build workflows that are driven by accessible, sensible, and rock-solid tools that enable your contributors to do great work quickly and easily. Chapter 6 – Building Buzz – With a solid foundation in place, we move on to build excitement and buzz around your community and encourage and enthuse every man, woman, dog and pony to get involved and participate. Chapter 7 – Measuring Community – Although many consider community hand-wavey and unmeasurable, this chapter confronts the myth and guides you in tracking, monitoring, and otherwise measuring the work going on the community so it can be optimized and simplified. Chapter 8 – Governance – Our next stop is the wide-ranging and seemingly complex topic of governance. We explore what options are available for a low-friction, capable, and representative governance strategy for your community. Chapter 9 – Handling Conflict – One of the most sensitive topics in community leadership is handling conflict. In this chapter we explore how to identify, handle, and prevent irksome conflict; handle divisive personalities; and unblock problems. Chapter 10 – Creating and Running Events – Events offer an excellent opportunity for your community to bond, be productive, and have fun, and this is where we cast our beady eye in our penultimate chapter. Chapter 11 – Hiring a Community Manager – Finally, we close The Art of Community with some advice and guidance for organizations who want to hire a community manager to conduct and implement the wide range of topics that we have discussed throughout the book. The book is further augmented with an active website complete with discussion, articles and updated news and content about The Art of Community. You can find out more at www.artofcommunityonline.org. “The Internet provides the potential to separate us into a cacophony of discordant voices or to congregate us as purpose-driven communities. 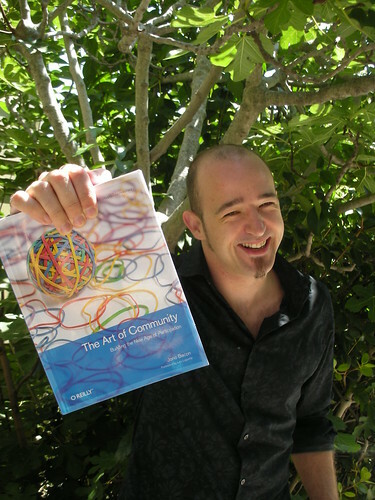 Jono Bacon, in his insightful ‘The Art of Community’, teaches the latter path, detailing the principles of successful community-building in a way that will appeal to both neophyte and expert alike. 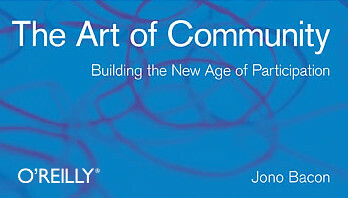 Given the increasingly critical role of community managers in the technology industry and beyond, ‘The Art of Community’ should find a place on any businessperson’s bookshelf, not to mention that of the PTA president, book club organizer, or union activist. Yes, it’s that good”. “Jono Bacon truly understands communities–and more importantly, how to build communities that thrive. This is the definitive guidebook to building successful communities–definitive because it is based on Jono’s extensive experience as community manager for Ubuntu, a product that inspires an Apple-esque devotion in very large part because of its vast and dedicated community. For developers and entrepreneurs who want to learn how to tap into the power of community, as Ubuntu has done so masterfully, this book is a must-read”. “One thing that’s impressed me about Jono Bacon, something one can notice back when he and others were building a community around their pioneering Linux podcast, is that he simply gets the concept of community. It comes out in most everything he says, and most every decision he makes. This is the kind of a person you want writing a book on the topic. open source community building cannot be boiled down to a formula. It’s a constant effort, a soft science, an art, and Bacon is an ideal art teacher”. “The success of the open source software movement demonstrates that no obstacle is insurmountable when people come together around a shared vision. In ‘The Art of Community’, Ubuntu community manager Jono Bacon gives readers a profound glimpse into his hands-on experience as the orchestrator of one of the movement’s most powerful communities. His book offers valuable lessons on effective leadership and community building. Its compelling combination of useful theory, real-world best practices, and instructive personal anecdotes make it a richly comprehensive guide for both aspiring and experienced community leaders”. Mark R. Hinkle, Vice President of Community, Zenoss Inc.
Don Marti, Conference Chair, OpenSource World and Organizer, Windows Refund Day, Burn All GIFs Day, Free Dmitry, and FreedomHEC. As the book gets more reviews I will be updating that page. But you, dear reader, would you like to write a review of The Art of Community? If so, send the review text with your name and affiliation to jono AT jonobacon DOT org! The book will also be freely available shortly under a Creative Commons Attribution ShareAlike Non-Commercial license. It’s availability will be announced soon. Kudos to you, Brother Jono. Count on me to blog it. Why is the PDF more than double that of the Kindle? and only $3 less than the printed version. Personally I think you have done a great job for Canonical and would be very interested in the book but finding it hard to justify that sort of money for a download. I meant to write the same thing. This picture would make a superb hackergotchi! Congratulations. This is a huge effort and I look forward to reading it. Congratulations Jono! I can’t wait for my copy to arrive. So, the price to avoid Amazon’s DRM is $14. Nice! I pre-ordered your book on Amazon and am eagerly awaiting shipment (Currently Amazon are stating it will ship on August 25, 2009). I really enjoyed the first chapter that you recently released, and look forward to reading the rest. I will be sure to leave a review on Amazon as soon as I am done. to build, energized and enable pro-active, productive and enjoyable communities… you should just provide the PDF for free! Please… a free copy of The Art of Community!